Would you like to practice speaking and listening in English? 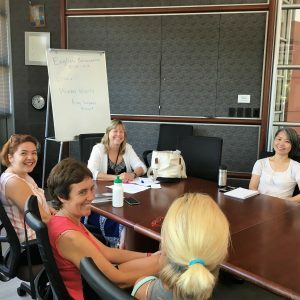 Conversations in English (CIE) groups at Boulder Public Library provide English learners with opportunities to practice their speaking and listening skills in a friendly and informal environment. Groups meet weekdays at Boulder Main Library. Adult learners can attend the free groups on a drop-in basis. No registration is required! You can also check the library calendar. Groups are led by volunteer facilitators who are native-English speakers and guide conversations on relevant life-skills topics. If you are interested in facilitating a group, please contact 303-441-3151 to learn more.